Not Enough Backyard Privacy? Install The UpRite Cover Lifter To Better Enjoy Your Space! The UpRite lifter provides quick and easy access by simply flipping the cover lid. What makes this cover truly unique, is that it can double as a privacy fence. 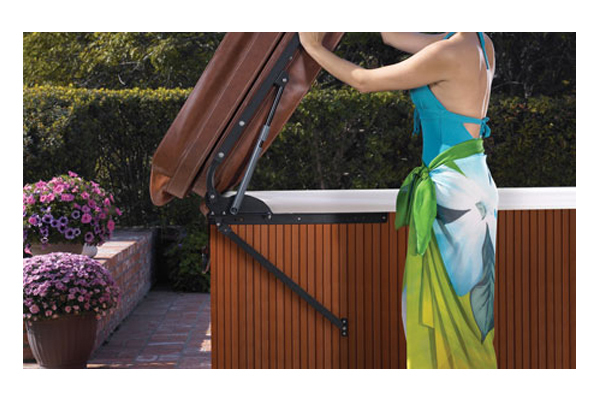 For hot tub decks, gazebos or other areas where clearance is limited, the UpRite allows you to position the cover vertically, just behind the spa. Shield your neighbours and create the soothing and private sanctuary in your backyard, on your deck, or under a gazebo.